Most research on teas has focused on organic composition and less attention has been given to the mineral composition. The aim of this study was to examine and compare the mineral compositions (Na, Mg, K, Ca, P, S, Fe, Mn, Zn, Cu and Al) of eight commonly consumed teas. The teas included three traditional black or green teas (from Africa, China and Sri Lanka) and five herbal teas - two from South America (maté and coca) and three from South Africa (rooibos, honeybush and Athrixia phylicoides). Analyses were conducted on five samples of dry tea leaves of each of the teas and their infusions (steeping time: 6 min) using identical techniques in inductively coupled plasma optical emission spectrometry (ICP-OES). It was found that each tea has a unique mineral profile. Dry tea leaves and their respective infusions also exhibited different mineral profiles. The tea infusions that contained relatively higher concentrations of beneficial minerals were maté, coca and Athrixia. High levels of aluminium were found in the traditional black and green teas whilst rooibos was high in sodium. Although teas are not rich sources of nutrients, the consumption of maté could contribute significantly to dietary manganese requirements. Teas are exceptionally rich in polyphenolic compounds (flavonoid and phenolic acid), which are potent antioxidants that scavenge free radicals and thereby protect the body from disease.3,4 Consequently, most of the research aimed at exploring the possible medicinal properties of herbal teas has concentrated on their organic chemical constituents and the mechanisms by which they produce medicinal effects. Considerably less research has been conducted on the mineral composition of teas. Although literature is available on the mineral composition of individual teas, comparative studies for the same minerals, using identical conditions and analytical procedures, are rare. Moreover, it is not known whether the teas available to the South African consumer have the same mineral composition as those in other countries where such research has been undertaken. Some minerals are essential for the functioning of the human body,5 with deficiencies (and in some cases, excesses) causing serious diseases,6 whilst other minerals are harmful, even in small quantities.4 In view of the growing consumption of teas, it is important to determine their mineral composition in order to assess the possible health effects of tea on the consumer. The aim of this study was to examine and compare the mineral compositions of eight teas (leaves and infusions) originating from different parts of the world and to determine whether they could contribute to the daily nutritional mineral requirements of consumers. The concentrations of potentially harmful minerals in these teas also received attention. The teas were two brands of traditional black tea (Camellia sinensis), one comprising a blend of teas from various African countries and the other claiming to be pure Ceylon tea; green oriental tea (Camellia sinensis); maté (Ilex paraguariensis) from Brazil; coca tea (Erythroxylum coca) from Peru; and three indigenous South African herbal teas: rooibos (Aspalathus linearis), honeybush (Cyclopia intermedia) and an as yet uncommercialised indigenous tea from the Limpopo Province, Athrixia phylicoides (hereafter referred to as Athrixia). All, except maté and Athrixia, are readily available in South African supermarkets. The mineral content of the dry tea material and the infusions produced from them were analysed for 11 minerals, namely, sodium (Na), potassium (K), calcium (Ca), magnesium (Mg), phosphorus (P), sulphur (S), iron (Fe), manganese (Mn), zinc (Zn), copper (Cu) and aluminium (Al) using identical analytical procedures. According to Malik et al.19, a number of studies have reported high levels of Al in traditional tea infusions. Because high levels of Al have been associated with neurodegenerative diseases such as Alzheimer's and Parkinson's,20 tea consumption may be a cause for concern. The eight teas selected for the study thus represent a variety of traditional teas from different geographical regions (Africa, Sri Lanka and China) and herbal teas from South America and South Africa. All eight teas are consumed in high quantities that are thought to contribute to the health status of the consumers. Five packets each of commercially available black, green, coca, rooibos and honeybush teas were purchased from supermarkets and health stores in Pretoria, South Africa. Two kinds of black tea were purchased: one contained a blend of tea grown in various African countries and the other was purported to be pure Ceylon tea. Boxes of the commercial teas were purchased from different stores. The boxes of black, green, coca and rooibos teas contained tea infusion bags, which each contained about 2.5 g of tea. Some of the boxes of honeybush and maté teas consisted of tea bags and others of loose-leaf plant material. One of the boxes of maté tea was purchased in Brazil; the others were purchased from a local store in Pretoria. Dry Athrixia leaves and small twigs were harvested from the Haenertsburg and the Sekhukhuneland regions of the Limpopo Province in South Africa during 2007, 2008 and 2009 and dried in accordance with traditional tea preparation methods.35,36 The South African Biodiversity Institute (SANBI) in Pretoria verified the plant material as being Athrixia phylicoides. All chemical analyses were conducted at the Agricultural Research Council (ARC) Institute for Soil, Climate and Water laboratory in Pretoria. Weights for mineral analysis were standardised at 1 g of dry leaf material. Samples were taken from each of the five sources of each of the eight teas for analysis (i.e. a total of 40 samples). Analyses were replicated thrice to ensure accuracy. Where applicable the tea leaves were removed from the tea bags. Samples of all teas were ground prior to analysis to approximate the same size distribution of plant material. Samples (1 g) were digested with 7 mL HNO3 (65% AR nitric acid) and 3 mL HClO4 (70% perchloric acid) at temperatures up to 200 ºC and brought to volume in a 100-mL volumetric flask. An aliquot of the digest was used for the inductively coupled plasma optical emission spectrometry (ICP-OES) determination of Ca, Mg, P, K, Na, Fe, Zn, Mn, Al and Cu. Each element was measured at an appropriate emission wavelength, chosen for high sensitivity and lack of spectral interference. The wavelengths used were 383.826 nm for Mg, 422.673 nm and 317.933 nm for Ca, 213.618 nm for P, 769.896 nm for K, 589.592 nm for Na, 259.94 nm for Fe, 257.61 nm for Mn, 213.856 nm for Zn, 324.754 nm for Cu and 396.152 nm (confirmed 308.215 for digests) for Al. The instrument (Varian-Liberty 100 ICP-OES spectrometer, Varian Inc., Palo Alto, CA, USA) was calibrated against a series of standard solutions containing the elements of interest in the proportions found in typical leaf samples. Sulphur was also determined by ICP-OES using a wavelength of 181.978 nm employing a JY Horiba Ultima (after being purged with nitrogen to prevent interference from atmospheric oxygen). All eight teas were prepared using a ratio of 1 g per 100 mL boiling water and infused for 6 min (to ensure standardisation). Infusions were prepared by adding 2 g of dry tea material to 200 mL boiling deionised water. The resulting infusion was stirred with a glass rod for about 30 s to ensure proper wetting, covered and steeped for a total of 6 min. The steeped infusion was then immediately decanted through a fine stainless steel sieve to remove contact with the tea leaves and allowed to cool. Thereafter, the cooled solution was filtered and analysed using the procedure outlined above. Means and standard deviations were calculated for each of the minerals. Several one-way analyses of variance (ANOVAs) were performed using Statistical Package for the Social Sciences40 to calculate whether there were any differences amongst the mean concentrations of each of the identified minerals for the different samples of teas. If significant differences on the ANOVA F-statistics (based on the mean sum of squares) at the p < 0.05 level (or lower) were observed, a Duncan's post-hoc test was conducted to determine which tea samples differed from the others. Perusal of the mineral composition data presented in Tables 1 and 2 reveals that each tea contained the full set of eleven minerals. However, the amount of a specific mineral differed from one tea to another, displaying a unique mineral profile for each tea. It is also clear that the dry tea leaves and corresponding infusions exhibited different mineral profiles. According to our results presented in Table 1, five of the six major minerals (K, Ca, Mg, P and S) are the most abundantly occurring minerals in the dry tea leaves. The infusions exhibited the same general pattern except that relatively less Ca than Mg, P and S was present (Table 2). Three of the trace minerals - Zn, Cu and Fe - were the elements present in the lowest concentrations in both leaves and infusions. Comparison of the mineral profiles (Table 1) of the eight dry tea leaf samples reveals that Athrixia, black and coca teas had the highest total mineral content. Maté and coca teas had the largest variety of minerals in appreciable amounts, followed by black and green teas. The herbal teas, rooibos and especially honeybush, had significantly lower amounts of all minerals (except sodium in rooibos). The Camellia sinensis teas were the richest sources of K, Cu, S and Al, whilst maté tea leaves were exceptionally rich in Mg, Mn, Fe and Zn. The highest concentrations of Ca were in Athrixia and coca leaves. Coca tea leaves were also rich in P and Fe. These results are largely consistent with those obtained by Malik et al.19 for Ca, Mg, Fe, Mn and Zn. However, Malik et al. found considerably lower amounts of Al in black and green teas than were found in the present study. It should be noted that the results for Al obtained in this study agree with those of Jansen et al.41 who indicated that Camelia sinensis are Al accumulators and concentrations exceeding 1000 mg/kg have been found in their leaves. The variation in mineral profiles between the tea leaves may be as a result of a number of factors, the most likely being differences in the soil type, climate,42 altitude, cultivation procedures such as fertiliser application, and genetic differences between the different plant species. It is notable that rooibos and honeybush, both indigenous to the Cape and which grow in sandy soils, had similar mineral profiles. Rooibos, which grows only on the West Coast, was exceptionally rich in Na. Conversely, Athrixia, which grows in dolomitic areas, contained relatively large amounts of Ca and Mg. Comparison of the profiles of minerals in the infusions of all eight teas (Table 2) reveals that black teas provided the richest sources of all minerals; in terms of high concentrations of individual minerals, maté and coca teas were superior to all the other teas. Excluding Al, black tea from Sri Lanka (Ceylon) surpassed tea made from a blend of African teas as a source of minerals, and Athrixia was a richer source of minerals than the other South African herbal teas. These mineral profiles of the infusions are generally in agreement with previous research19,43 indicating that the concentrations of a number of minerals in traditional black and green teas far exceeded those in South African herbal teas. A comparison of results with those by Malik et al.19 showed that our values were lower across the board, except for Al. These lower values could be expected because Malik et al. infused their tea leaves for 15 min, whilst our steeping time was only 6 min. In order to determine to what extent tea consumption might supply dietary minerals, the amount of available minerals for each cup of tea was calculated. These amounts were derived from Table 2 using a conversion factor of 1 mg/kg = 0.0025 mg/cup, assuming that 1 g tea leaves are used per 100 mL boiling water at household level, and that 1 cup holds 250 mL liquid (Table 3). The nutritional attributes of tea consumption can be assessed by comparing the values in Table 3 with the dietary reference intakes (DRIs) given in Table 4. It is evident that teas contain minute amounts of minerals, and therefore they do not make a significant contribution to meeting mineral requirements. The exception is maté tea which provides about 1.95 mg Mn per 250 mL (Table 3). 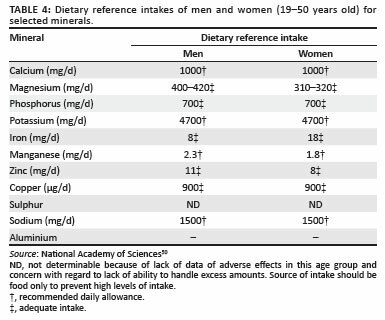 This concentration is the required daily Mn intake for adult women (Table 4). Men would have to consume at least one and a half cups of maté tea per day to meet their DRI for Mn. The positive contribution that maté tea could make as a dietary source of Mn has also been noted by others.19,45 Although green and black teas from Africa also contain considerable amounts of Mn, consumption of three to four cups would be required to meet the daily Mn requirement. Even though the K levels are higher than any of the other minerals in all of the teas, one cup of tea still provides less than 1% of the DRI for adults. In this study, none of the other infusions could be considered as rich sources of the major and trace minerals. The low concentrations of potentially harmful minerals in teas can be considered to be advantageous. Sodium is present in very low concentrations in all eight teas. Even rooibos, with the highest Na content, could not be considered to constitute a health risk. Concerns have also been expressed about the intake of Al in food,46 as well as in traditional teas.45,46,47 The World Health Organization (WHO)48 limits the Al content in drinking water to 200 µg/L (i.e. 0.2 mg/L or 0.05 mg/cup49) and, in 2007, the WHO48 established a provisional tolerable weekly intake for food of 1 mg Al/kg body mass. The Al concentrations of 1.25 mg/cup of black tea and 0.9 mg/cup of green tea should be taken note of by people with low body mass who consume numerous cups of tea per day. The excessive consumption of black and green tea by young children should be discouraged. We have reported on the mineral content of three traditional black and green teas and five herbal teas from different geographical regions. Traditional teas all derive from the plant Camellia sinensis, whilst the herbal teas included maté and coca teas from South America, and rooibos, honeybush and Athrixia tea from South Africa. All eight teas are consumed in relatively high quantities and are believed to have health-promoting properties. Chemical analyses were conducted to determine the concentration of eleven minerals: Ca, Mg, K, Na, P, S, Mn, Zn, Fe, Cu and Al, in dry tea leaves as well as in tea infusions, using ICP-OES. Although the recommended infusion times vary between 30 s to 10 min or more for different infusions and, traditionally, some of these teas are boiled, a standard infusion time of 6 min was used in this study for two reasons. Firstly, to ensure standardisation of results and, secondly, to determine mineral intake levels of the common consumer who rarely has time to boil the infusions or infuse 'teas' for more than a few minutes before consumption. It should, however, be noted that differences in infusion time may well affect the bioavailability of minerals. We found that all teas contained the full complement of eleven minerals, but in minute quantities when compared to the daily mineral requirement. The exception was the concentration of Mn in maté tea - one to one-and-a-half cups of maté tea per day could supply the recommended intake of Mn. Our study thus confirms previous findings21 indicating that, in general, teas cannot be considered as a major source of dietary nutrients. Nevertheless, even the small amounts of minerals present in teas would supplement those nutrients consumed in food. Paradoxically, the low concentrations of some minerals may be advantageous. Al is present in very low concentrations in the speciality teas but its higher content in black and green teas should be noted. A comparison of the mineral content of the eight teas revealed that maté and coca teas were superior to the others. Although Camellia sinensis teas have higher values of K, Cu and S than the other teas, their relatively high Al content detracts from their postulated health effects. Rooibos and honeybush have considerably lower concentrations of most minerals when compared to the other teas. Of the three South African indigenous herbal teas, Athrixia is the most mineral rich. In terms of their mineral profiles, the consumption of herbal teas such as maté, coca, rooibos, honeybush and Athrixia teas are a good choice for health-conscious consumers. We thank the University of South Africa and the National Research Foundation of South Africa for financial support (GUN: 2048685); Lynne Meyer and Leslie Adriaanse for editorial assistance; Jackie Viljoen and Unisa Language Services for editing the manuscript and Christel Troskie-de Bruin for critical reading. We also especially thank Nina van Vliet and Mike Phillpott (ARC-ISCW), not only for developing the analysis methods, but also for their constructive comments and suggestions on the manuscript. J. Olivier was the project leader and principal researcher. C.Z. Jonker, I.T. Rampedi, T.S. van Eeden and E.A. Symington made significant conceptual contributions to the research and wrote parts of the article.